News just in from the Museums Australia conference in Adelaide, our Marnti warajanga – a walk together travelling exhibition has won the Museums and Galleries National Award for the level 3 category ($150,000 to $500,000) temporary exhibition. Marnti warajanga was developed in association with the Wangka Maya Pilbara Aboriginal Language Centre and photographer Tobias Titz. The travelling exhibition was funded by BHP Billiton and the Australian Government through its National Collecting Institutions Touring and Outreach (NCITO) Program. In May and June of 2012 Marnti warajanga – a walk together toured five communities in the Pilbara. The tour consisted of a redeveloped travelling exhibition, photography workshops and community celebration events, with an online Pilbara Tour component inviting comment, perspectives and understandings from the communities. Judges felt that this project was outstanding in its treatment of its subject. It was focused, probing and innovative. They especially appreciated the project’s degree of consultation with Indigenous people and community representatives on important aspects of social memory and Indigenous activism, and the connection and interweaving of these stories and memories with powerful strands of Australian social history in the cause of voices from the whole of Australian experience contributing to and deepening an understanding of ‘democracy’ as underpinning the museum’s mission. This prestigious award is testament to the professionalism and commitment of all our staff. As a small museum, this project owes its success not only to the core team who tirelessly worked on Marnti warajanga – a walk together, but also to the valued contribution of staff across the organisation. We’re all very proud of this award. Experience the Marnti warajanga – a walk together exhibition online. 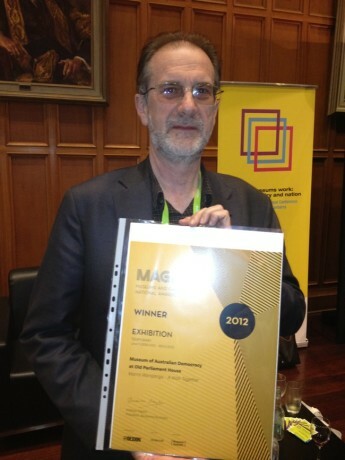 The MAGNA 2012 winners can be seen at the Museums Australia website. Michael Evans, Manager of our Visitor Experience and Content Development section, accepting the Museums Australia MAGNA award for Marnti warajanga - a walk together.